In the Spring of 1981, District Deputy (at that time) Robert Kocurek of Duncan, called upon Father Kevin Wiseman, Pastor of the Church of the Ascension in French Creek and discussed the prospect of forming a Council in the area. Father Wiseman gave his approval and suggested that Bro. Kocurek contact Gordon Mc-Murray, Frank McKinnon and Frank Gaunt, all longtime Knights from other parishes - which he did. A Steering Committee was formed and in December, 1981 two information meetings were held for members of our parish. Out of these meetings and by personal contact, we were able to sign up ten new members and twenty-one transfers and/or re-instatements. On January 19th, 1982, a meeting of fifteen signed-up applicants was held in the parish hall, attended by District Deputy Robert Kocurek. An executive was elected and the Council name, Ascension, was adopted. A First Degree Initiation was held for the new applicants in the parish hall. This Degree was conducted by Duncan Council 4253, First Degree Team. After the Exemplification of the First Degree, the inauguration and installation of officers was carried out by District Deputy Kocurek. These ceremonies were followed by a dinner and social catered by the C.W.L. of the Church of the Ascension Parish. We were impressed and pleased by the welcome and generosity of brother Councils. Grand Knight Steve Cronin presented the gavel and base, and a cheque for $100, on behalf of Duncan Council 4253. A large name plaque commemorating past Grand Knights was presented by Brother "Mac" Witzel, State Secretary, on behalf of Dr. Briggs Council 4597 of Courtenay and a Holy Bible was presented by District Deputy Robert Kocurek. Ascension Council held its first regular meeting in the parish hall. One important item of business, amongst numerous other items, was the establishment of a monthly newsletter which is mailed to each member of the Council following each monthly meeting. A Second and Third Degree Initiation, at which four of our new members attended, was held in Victoria on March 27th, 1982. The Exemplification was conferred by the Second Degree Team from the Lower Mainland and the Third Degree Team from Washington State. At an executive meeting in August 1982, Grand Knight Bro. McMurray reported that Ascension Council 7991 had been assigned to District No. 2- the District Deputy being Bro. L.M. (Bert) Beks of Courtenay. Second and Third Degree Initiations were held, this time in Duncan, at which the remaining new candidates were able to attend. Also in November, the first death occurred in our Council - Bro.Gerald Hagel. An important event took place on December 11th, 1982 when, at an appropriate ceremony, Ascension Council was presented with its Charter by State Deputy Len Bergonder. 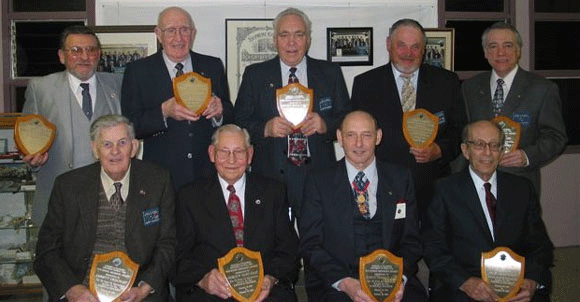 All new Third Degree members also received a Certificate of the Third Degree. This was followed by a dinner and social evening. Ascension Council continued to grow in numbers to the point that we were able to send additional candidates to a First Degree Initiation held in Port Alberni in March, 1983 and also to a Second and Third Degree Initiation held in Port Alberni in April, 1983. As of May 1st, 1983, we have 35 members enrolled in the Council. The Council has also continued to grow in activities within our own Parish. The attendance at the monthly meetings is considered to be good for a new Council but of course, there is always room for improvement. We are fortunate in having dedicated and hard working executive officers. The installation of officers for the second year took place on June 11th, 1983 in the Church of the Ascension Parish Hall. There are 3 surviving Charter Members, Lou Biggeman (Ascension Council 7991 in Parksville), Wayne Feser (District Deputy #22 and a member of Council 2552 in Langley) and Ron Nicholas (Dr. Briggs Council 4597 in Courtenay). The District Deputy at the time Robert Kocurek (is a member of Duncan Council 4253) and was State Deputy from 1986 - 1988.